Many hospital services have been lost to the wider South East community as Country Health SA (CHSA) continues to downgrade Millicent Hospital and centralise services in Mt Gambier. Felicity and James Masters wanted to speak to us about their recent birthing experience and how the decision to downgrade their local hospital services, which has included cancelling Obstetric Services has affected them, especially when post natal care was not available. Felicity and James had two children and were expecting their third. Their daughter was born in Millicent Hospital seven years ago. Five years ago when Felicity went into labour with their son, they rang the Millicent Hospital to say they were coming in and were surprised to be told that there was no anaesthetist available and they were sent to the Mt Gambier Hospital for the birth. Two weeks ago (Saturday) in her third pregnancy, Felicity began having contractions. Her husband drove her to the Mt Gambier Hospital. After approximately 9 ½ hours, the contractions stopped and she was discharged from hospital to go home to Millicent. Contractions began again soon after she arrived home and they continued all week. 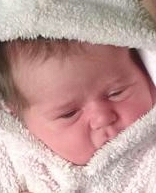 Felicity could not return to Millicent hospital because post natal care wasn’t available for her, she told me. Felicity and James traveled home to Millicent by car, with their new baby daughter Alexis who was 4 ½ hours old. Felicity said she’d had no medical care since the birth but had made an appointment to see her local doctor for a check up. Felicity said she had been visited by the midwife during the two weeks since the birth and the midwife was excellent. Felicity said her sister lives in Bordertown, had two difficult births and when her third child was due, it was in a breach position. When labour began, they rang Naracoorte Hospital and were told there was no anaesthetist and she would need to go to Mt Gambier. Her husband drove her to Mt Gambier, (185K’s) from Bordertown, where she had an emergency C-section. A spokesperson for the Naracoorte Hospital said today the hospital does have full obstetric and anaesthetic cover 7 days a week. If there are any gaps in the service, the community is advised and patients are forwarded to Mt Gambier. Felicity and James wanted to highlight the difficulties facing new parents since the closure of Obstetric Services at the Millicent Hospital. They found the additional travel when Felicity was in labour, the stress on the father driving her there and cuts to staffing at the Millicent Hospital which prevented Felicity returning there for her recovery, all negatively impacted their experience, but in highlighting these problems are not criticizing the hospitals, staff or any individual. The closure of Obstetric Services at the Millicent Hospital in July 2013 caused a public outcry with 650 people attending the Public Meeting and a petition signed by thousands of concerned residents was tabled in parliament by local member Hon Mitch Williams. CHSA said they would re-enter negotiations with the local doctors but to date Obstetric Services remain closed at the Millicent Hospital. Obstetric Services between Murray Bridge and Mt Gambier, a distance of 360K’s approximatel, have now been closed. ‘Following the birth, women can continue to access post natal care at their birthing hospital in Mount Gambier or Naracoorte. Women who wish to receive the remainder of their post natal care at Millicent Hospital are transferred at the most appropriate time for them and their baby,’ said CHSA. Categories: Health, Human Interest, Millicent, Mt Gambier, Wattle Range | Tags: millicent hospital, Mt Gambier Hospital, obstetric services | Permalink. babies come when they are ready and often there are afew false alarms along the way. I hate travelling between millicent and mount gambier at dusk, dawn or even during the night with the number of kangaroos out at certain times of the year. I think my record count is 18 one evening and i often wonder is someone going to be travelling to the hospital for their baby to be delivered and hit one of them causing injury to themselves and their yet to be born child. This government seems to have money to spend on people who land uninvited on our shores but no funds for hospitals, education and other essential services for the taxpayers and ratepayers of this country.